I’ve had my hair long the majority of my life, although it can be a beast to tame and maintain! I’m due for a cut and I’m tempted to chop it all off since Azelie loves to yank it every time I pick her up! Ouch. I feel most like myself when it is longer though, so I continue to hunt for products that don’t cause greasy or dull lifeless hair. I had to try several items before finding some that helped restore it’s natural wave, but also allowed it to grow out after all of the post-baby hair loss! 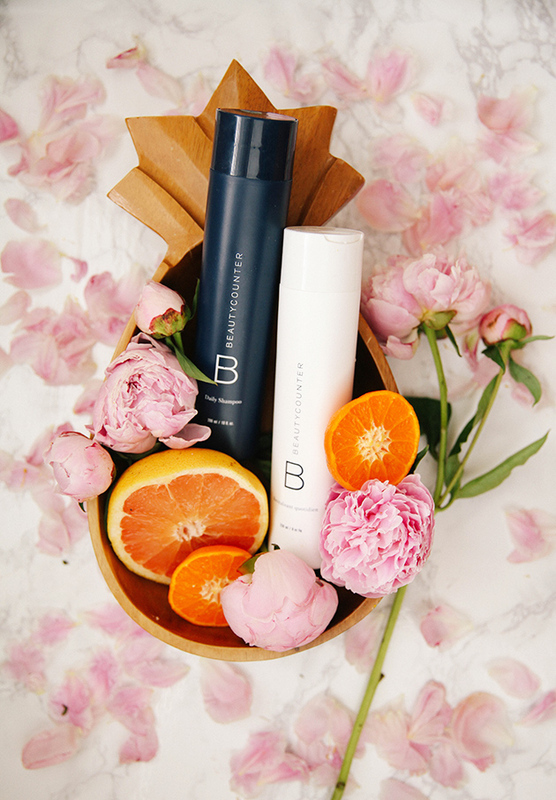 Here are some things that have been really effective for me…..
BeautyCounter Daily Shampoo + Daily Conditioner – There aren’t many safe ingredient shampoos out there, but also the ones I tried previously still left my hair feeling a little greasy or flat. This combination has pur plant botanicals that help get rid of build up while also infusing moisture and shine. The citrus scent is really nice. The conditioner contains marula and mongongo oils that help smooth and add shine so I really noticed my waves come back after just a few uses of this combo! I never wanted to pay more than $10 for shampoo, but after reading about how many of the ingredients added to shampoos are absorbed through our scalp I wanted to search for a healthier option. Using a clean ingredient shampoo also allows you to go longer in between washes so the supply stretches farther as well. Scalp massage with lavender oil + Vitamins– Massaging your scalp helps blood flow and circulation which promotes healthy hair growth. I use a little DoTerra lavender oil in my shampoo every so often to massage into my scalp which helps with post pregnancy hair! I also take daily essential oil vitamins and hair vitamins. I was sent a sample of Hum Vitamins that is loaded with vitamin E, and I noticed a halt in my postpartum hair loss, so I will probably order more of those! Side note – for added volume boost if I didn’t wash my hair that day, I use a sea salt spray! Smells divine too. I’m giving away 3 BeautyCounter Shampoo and Conditioner Sets! 1.Leave a comment on the blog post. 2. You can get an extra entry for pinning a blog image on pinterest, and commenting with the pin link. That’s it! I will be drawing the winners via random.org at the end of the week! *I joined BeautyCounter because I fell head over heels for the way their products worked for my hair and skin. I will only share what I really love, and be honest about how they work! If you have any questions about them or want to consider also joining my team, feel free to email me! BeautyCounter is launching a whole line of hair products this fall that I am anxiously awaiting! i keep adding the shampoo and conditioner to my cart but not checking out! i need to just do it! I would love to win this giveaway! Was looking into Beaty counter products! My hair is finally growing, and I’ve been looking for a good shampoo. I’d love to try this and the conditioner, too! I’ve been intrigued by Beauty Counter. I appreciate your up-front info. Do you let your hair dry naturally or do you blow dry? I have wavy hair too and find it hard to tame the frizz or get my hair to look consistent. Would love some pointers. Thanks! I used to have wavy hair and some time after puberty it just got flat! 🙁 Am definitely going to try adding a few drops of hair oil with my shampoo for a scalp massage – good idea! Love this, Anna! I’ve been using Aveda shampoo for years – it’s the only thing I’ve found that works on my sensitive scalp. But I’m not wild about their conditioners, so I’d love to try BeautyCounter’s! I’ve never heard of Beauty Counter before – it looks amazing! My hair has been in crisis mode, and I’m on the hunt for good clean hair products that will help repair it. I’ve chopped off a lot in hopes that it will help, and it has, but nourishing what i do have is top priority now. Love the idea of all natural ingredients. Looking for something like that for my hair. I know too many people diagnosed with brain cancer recently and it certainly makes you wonder. So many chemicals! So not ready for the post baby hair loss!! I tried to switch to a safer shampoo so many times but nothing seemed to work for my hair. Thank you for letting us know about your experience with Beauty Counter products, I’m going to give them a try! Love! I feel like we have similar hair types. Would love to try out BeautyCounter! I am obsessed with my BeautyCounter products and would love to try their shampoo and conditioner! So glad to know im not the only one that finds their hair flat and lifelessness after using an organic/clean shampoo! So interested in trying this! I’ve been switching over to more natural products too, great post! I have been so interested in these two but have yet to try them. I have such a hard time finding shampoo and conditioner that I absolutely love and this pair seems like a really great option for me. I’m so interested about these products! My hair’s texture has changed drastically after having a baby and I’m in need of some help. This is giving me hope! I will certainly check them out! Thanks for the info! 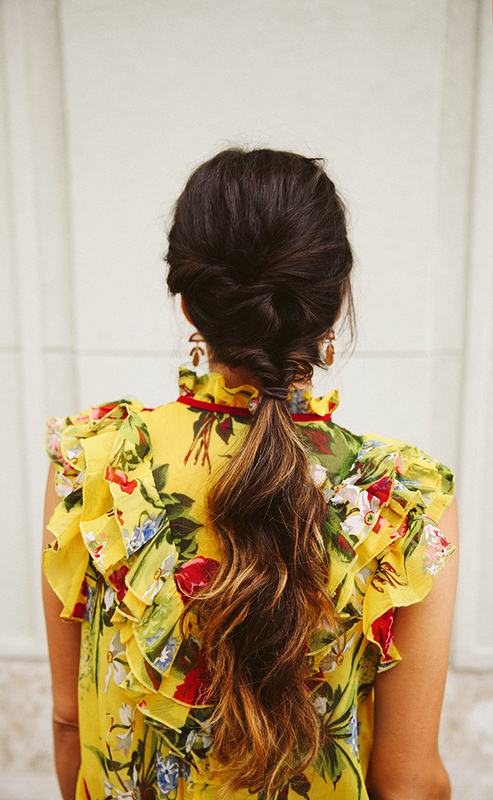 Your hair is so pretty long, but I think it would look really cute shorter – especially for summer! It’s so great that there are more and more products out there with natural ingredients. I would love to try this shampoo/conditioner duo! I was just thinking today that I needed to look into a new “clean” shampoo! Your hair is gorgeous. I’d love to find a haircare routine that nourishes my hair and complements my natural waves. This is a great giveaway. I’d love to try the shampoo and conditioner! So many women my age have dry, straw-like hair and I’m determined to have beautiful shiny locks. Always looking for products that will help! Thank you for this post. Clean beauty is so important, especially for us moms who want to both look good and also stay healthy for our families! You styled this so well! Love the peonies and citrus. Currently trying to maintain healthy long hair as well. I always feel like myself with longer hair too but I cut it off when I had my baby girl. I’m growing it out again and looking for some good products. Definitely going to check these out! Love this! We’re expecting our second baby in August. I naturally have more wavy hair and like to keep it long so these tips are great! I’m super interested in trying Beauty Counter’s shampoo/conditioner as I have yet to find a safe option that really works well. Plus I’m about to have my second baby and I am trying to emotionally prepare for my hair volume halving D: thanks for this info! Loving your info on what works for you!! Would love to try these! I’ve slowly been replacing everything in my home with more natural and safe products! I need new shampoo and conditioner and use other BeautyCounter products but have never tried these. I’ll have to give them a try! I have loved all of the Beauty Counter skincare I’ve tried, so I’d love to try their hair care as well! Good hair products! Sound Amazong! I would love to try this hair care! Fabulous blog post and giveaway , I would be absolutely ecstatic to win! Thank you for this post and the chance to win! These sound great, I would love to try them out! I’m always on the lookout for anything to keep my locks long and happy, especially after all the babies! This sounds like a healthy shampoo and conditioner that cleans your hair. Thanks for the giveaway! Thank you so much for this post. My baby number 3 is 8 months old and my postpartum hair loss is brutal. I can’t wait to try these products! http://pin.it/-3gYcXP here’s my pin link I use my Spanish name on Pinterest Lorena Pompa. I love the scalp massage idea! And the vitamins! Need those! Love every bit about your blog. Thank you for pouring your heart and soul into all you do! I adore your generous heart! I would love to try these! Been trying to transfer over to cleaner products for both beauty and home for some time… when one runs out I try to buy a cleaner alternative…. thought I was doing ok until I downloaded that app you suggested “Think Dirty”…. Wow eye opener…. now I’m compulsively scanning everything  Thanks for all your great tips! Amazing giveaway! I’ve been looking for a new shampoo and conditioner and would love to try this brand! Sounds perfect!! Been growing my hair out for what seems like ages. Would love to try a shampoo that can help my hair grow!! I love beauty counter products, want to try their hair care line! I’m always looking for new ways to strengthen my hair and would definitely give these a try! Love your hair Anna! Always have. It’s gorgeous! I have really long, flat hair. I use dry shampoo on the reg so I would love to try these products! Oh my! I would love to win this! I haven’t been able to try beauty counter yet. I have long hair for the first time in my life really and I’m struggling to find a shampoo and conditioner that I love. Crossing my fingers I win! Beauty Counter seems like a quality product, one I’ve wanted to try. Your hair looks incredible. I’ve been wanting to do something extra with my hair! The only products I use are drugstore shampoo and conditioner! I would love to expand my hair routine. Thanks for these tips- my hair dried out like crazy after my second pregnancy and I’m having trouble growing it. I might have to check these products out! Ahh! I have been wanting to try BC! Thank you for the tips! I’ve always had long hair, but a few months ago I decided to cut it off above my shoulders. I was in love with my haircut and I still love my short hair, but I miss my long hair. I’m growing it out again and would love to use this to keep it healthy and smooth. Beautiful HAIR AND great ideas! I have not tried the Beauty Counter hair products but seeing how lovely your hair looks it might be time for a change. Keep my fingers crossed to be a lucky winner. I have long hair too so I appreciate the info! I have been considering joining Beautycounter for a year- I love everything I have tried! So excited to hear that the shampoo and conditioner work great too! I haven’t found any “clean” shampoo that I love. I am beginning to embrace my grey hair and stop coloring it, but the grey is so dull. I wonder if this shampoo will help with that. I love your hair! I have similar texture & length and have not found a pure shampoo will lather and actually leave my hair feeling & looking good!! I am definitely interested in trying this shampoo and conditioner! I am loving this series! Oh I’ve been dying to try these products! My hair is already fried from the summer heat. Fingers crossed! I’m trying to keep my hair long as well. I, too feel more myself with longer hair. But saying that, I find that as I get older, my hair gets drier and breaks more easily. Thanks for the chance to win such clean products! I’m growing my hair out from a pixie and would love to try these products to keep my new, longer hair healthy! I want long hair again! I chopped it after baby #2 but I think it’s time. What does he lavender do for post baby hair??!? Everything is different post baby!! I’d love to try this! My hair is such trouble! Love this!! Thanks for these recommendations! I’m so intrigued by Beautycounter! One of these days I’m going to try their products I was thinking of starting with their charcoal bar, but maybe I should consider their hair care first! I keep hearing about this shampoo and conditioner! I’ve almost always had long hair as well, and am always looking for better products! I never thought about your scalp absorbing all those scary ingredients! Yikes! I really need to get away from cheap, low quality shampoos, so I’d love to try these recommendations! I’ve been wanting to try their products forever!! Oh! I totally need a good shampoo in my life! My hair gets so brittle when I try and grow it out! That shampoo sounds so intriguing. My postpartum hair is in dire need of help! Just graduated college and am looking to revamp my hair before my full-time job start date. Would love to have the shampoo and conditioner to help out! Would love to try all of these products! Clean beauty is so important to me especially being pregnant. I also have long hair, I need a little body and shine. Would like to try the shampoo and conditioner for that reason! Thank you!!!! I’d love to try the shampoo! I’d love to try the shampoo and conditioner! I am curious about Beauty Counter as I have read so much so recently. I love my long hair and also would love to take better care of it! These products look great! Ugh, I can relate to weird postpartum hair!! I cut mine because it was too much to deal with with two babies under 2, but I really want to grow it again! Your hair is gorgeous. Thanks for making me think about what’s in my products! Have already switched household & baby stuff but not hair & beauty! I keep my hair long, too, but really need some help with it as its changed a lot in the last five years and is no longer curly. I have been wanting to switch to a safer hair-care routine for a while. $22 for shampoo seems steep, but if it works well it’s probably worth it. Yes! I love BeautyCounter! Thanks for the tips, lady. This long hair could use some TLC. I would love to try this! thank you! Aaaah this is so good! I’ve always struggled with keeping my hair healthy!! Love this post! I’ll have to try the scalp massage with lavender oil tip. These products sound great! And the post- baby hair loss is currently my life haha. I would love to hear more about restoring your natural wave! I’m still on the hunt for that perfect shampoo and conditioner. I will have to look into this one!! I have been wanting to try the shampoo and conditioner! Have been dying to try their products for such a long time! Your hair is amazing! I love your hair’s natural wave! I’ve never purchased or used Beaury Counter before, but I keep hearing good things! Thanks for the chance to win some of their products! Here is the pin link! I would like to try these products. Thanks! Love this! Everyone is always talking about all the junk we put on our faces but very few people are thinking about all the junk in hair care products! Would love to have a chance to give these a try! Haven’t yet found a chemical free shampoo & conditioner that I like. Would love to try these! Thanks Anna! Hoping this can tame my mane!! I need to really address my hair care. I’ve been pretty good about shopping for clean shampoo and conditioner, but not so much other products. I hadn’t heard of BeaeutyCounter before, I would love to give it a try! Never tried BeautyCounter so hope I win! I had never heard of this brand. Thanks for sharing. I’d love to win and try them out. I go back and forth about cutting my hair, too. We just moved to South Carolina and the heat + humidity means I want to wear my hair up all the time. But I like my hair longer, so I haven’t cut it off. I’ve been looking for a new shampoo and conditioner! I would love to try this!! Pinning it! I love this! Thank you so much for offering such a wonderful giveaway. I’m getting more intrigued with the Beauty Counter products, I’d love to try the hair products!! Your hair is beautiful! After hearing your praises of this product like I couldn’t help but order some! Id LOVE to try the shampoo and conditioner set. Wow, I just noticed this was in July! kolors Hair Strengthening Treatment. provides a complete hair care solution to all hair types and with out any side effects and kolors healthcare clinic is the best for hair fall treatment, baldness treatment, premature hair loss, alopecia and natural hair growth.